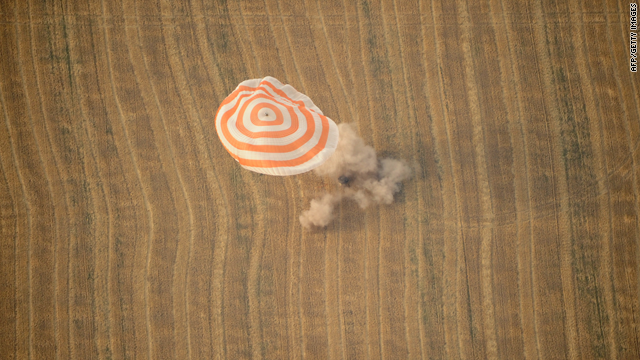 Soyuz TMA-22 lands in Kazakhstan at 7:45 am EDT, April 27, 2012. At 7:45 EDT today, the Soyuz TMA-22 craft landed in Kazakhstan, bringing home from the International Space Station three members of the Expedition 30 crew: Commander Dan Burbank, Flight Engineer Anatoly Ivanishin and Flight Engineer Anton Shkaplerov. Expedition 30 ran a series of science experiments studying how the human body adapts to weightlessness, and which materials are best for space exploration, among other topics. Expedition 30 also completed a spacewalk and welcomed resupply ships to the ISS. Onboard station, Expedition 31 officially began with the undocking of the Soyuz craft at 4:18 am EDT. The three men still in flight, Commander Oleg Kononenko and Flight Engineers Don Pettit and Andre Kuipers, will be joined by Flight Engineers Gennady Padalka, Joe Acaba and Sergei Revin in mid-May.